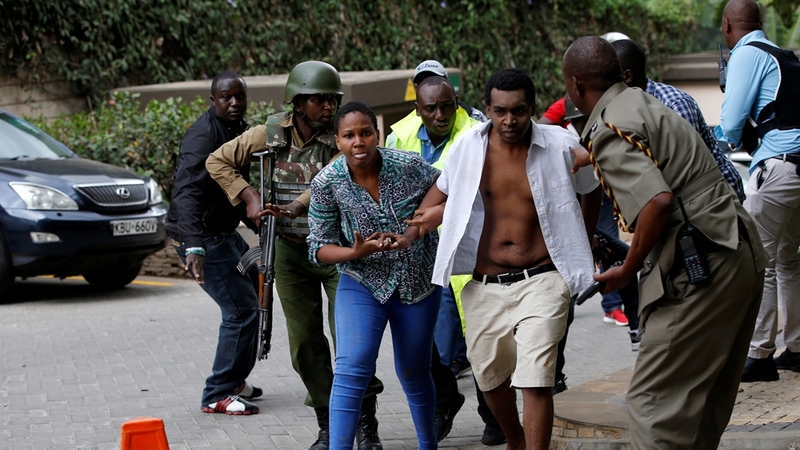 Two explosions and gunfire were heard at an upscale hotel complex in Kenya‘s capital on Tuesday afternoon, according to witnesses and police. The attack on the Dusit hotel complex – which also houses offices and banks – sent people fleeing for their lives, with black smoke rising from the scene. “We are under attack,” a person in an office inside the complex told the Reuters news agency. “It is terrible. What I have seen is terrible. I have seen a human as I ran out and there is what looks like minced meat all over,” said one a man who said he ran from the scene. He did not elaborate further. Gunfire continued several minutes after the first reports. A bomb disposal unit was on the scene and vehicles were being cordoned off for fear that they contained explosives. “We have sent officers to the scene, including from the anti-terrorism unit, but so far we have no more information,” Charles Owino, the police spokesman, told AP news agency. Somalia-based armed group al-Shabab claimed responsibility for the attack, saying that it was ongoing. “We are currently conducting an operation in Nairobi,” the group’s military operations spokesman, Abdiaziz Abu Mus’ab, told Al Jazeera. The attack came one day after trial began in the deadly Westgate mall attack that left 67 people dead in 2013. Kenyan prosecutors say the four suspects in the Westgate case currently on trial committed a terrorist act and used false documents. The men deny all charges. Tuesday’s attack is exactly three years after al-Shabab overran a Kenyan army base in Somalia, killing dozens of soldiers.